There is a very important note that must remain in the minds of all who read this, especially those who may be contemplating a visit to Yellowstone National Park. If you are a common visitor to this blog, you may remember that the Summer of 2016 was not the best time for those of us volunteering in the park. Not to belabor the point, but our experience was dampened by the actions of others. That was absolutely not the case during the Summer of 2017. While visitation numbers for this summer were not remarkably lower than those of 2016, it seemed that the visitors were much savvier as to how to conduct one’s self while on the edge of wildness. There were no “dumb tourist” episodes to dampen the spirits of visitors and workers. Even though there was solar eclipse with near totality within the park, the rush of visitors before and after the event was not terrible. Even though our campground filled earlier in the day than during any previous season, we found that we didn’t have nearly as many late arrivals who did not understand the folly of their decision to not find a campsite prior to visiting the sights. In other words, we as volunteers were able to enjoy the park much more this summer than last summer. The message I would like to leave with any potential visitors to Yellowstone is as follows. 1. Try to plan your trip in advance. Look at the websites for the various national parks on your to visit list and decide how much time should be allotted to each park. Remember, the park maps are pretty much all printed on the same size paper. That does not in any way suggest that all parks are the same size. Pay attention to the relative area of the parks you want to visit and how many miles of roads are within. 2. Specifically for Yellowstone visitors, try to either secure your first night in the park with a reservation or plan to arrive early in the day. By early, I mean you need to be at the entrance to the campground of choice before 8 AM. There are several campgrounds in Yellowstone that take reservations. Don’t show up at any of these without a reservation and expect to find a space unless you are arriving opening day and possibly not then. 3. Again, for Yellowstone visitors. There is a tendency for visitors to try to move from one campground to another over a two to three-day visit. I do not recommend doing that unless you have reservations at all or most of the campgrounds on your list. Since the first come first serve campgrounds fill so early in the morning, campers must break camp well before dawn to have a chance of getting a spot somewhere else. To me, it makes much more sense to pick a place to stay for most, if not all your visit and plan to drive the required miles to see the entire park. When Connie and I first visited the park that is exactly what we did. There were a couple of days when we wished we had brought more food with us, but it really did work out quite nicely for us. 4. Please pack your patience. The parks will remain busy places as there are fewer and fewer affordable commercial places around the country to visit. Also, it appears to this observer that there is an uptick in the numbers of young people who are really interested in the great outdoors, natural history, and wildlife. While that is great, it does mean that the parks will be busy for the foreseeable future. 5. Finally, when you get frustrated because you cannot find a campground with space, or parking at your favorite must-see sight, don’t blame the workers or the volunteers. We are there to help make your visit enjoyable. Just ask us what the alternatives are, and we will happily provide as much or as little information as required to make you comfortable. It also does no good to just say the park service needs to build more campgrounds, hotels and parking lots. Remember a big part of the mission of the park service is to preserve the lands under protection. Further development will not contribute to that vital mission plank or to a positive visitor experience. Now, let the summer of 2017 begin. As discussed in my previous post, we had our first personal visitors of the season arrive just as we were getting Indian Creek Campground open. They had planned their visit well and were therefore on independent operations while we worked. We truly enjoyed the hours we were able to spend with Scott and Laura Moorehead. 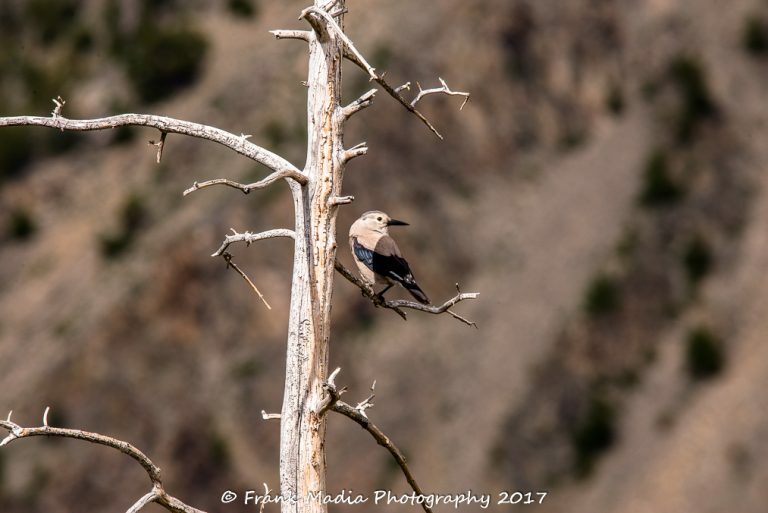 As has been our habit for most of the summers we have spent in Yellowstone, we teamed up with our co-workers, Rick and Donna Dumar for several day trips in and around the park. 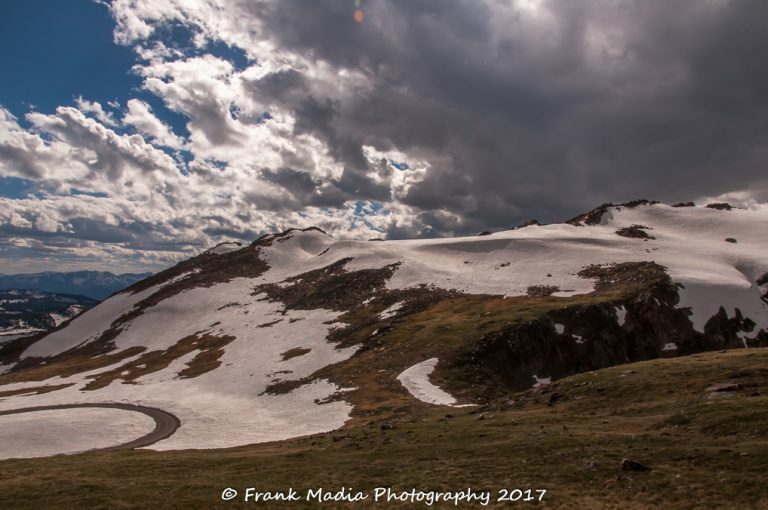 The plan for our first trip was to drive out the Northeast Entrance and make our way over the Beartooth Pass and have lunch in Red Lodge, MT. This is a drive we try to take at least once each year. 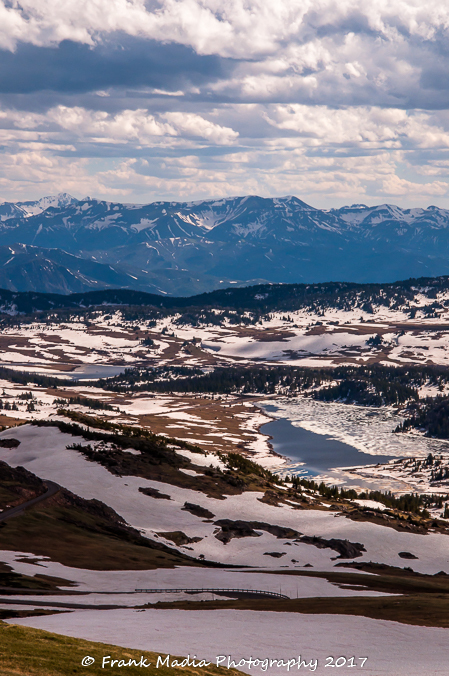 The Beartooth Pass is one of the most scenic drives in the country. Seeing it at different times of the season makes it all that more special as the scenery is in constant change throughout the relatively short time the road is open each year. To get to the Northeast Entrance from Indian Creek Campground one must go north through Mammoth, then east to Roosevelt Junction and northeast from there. 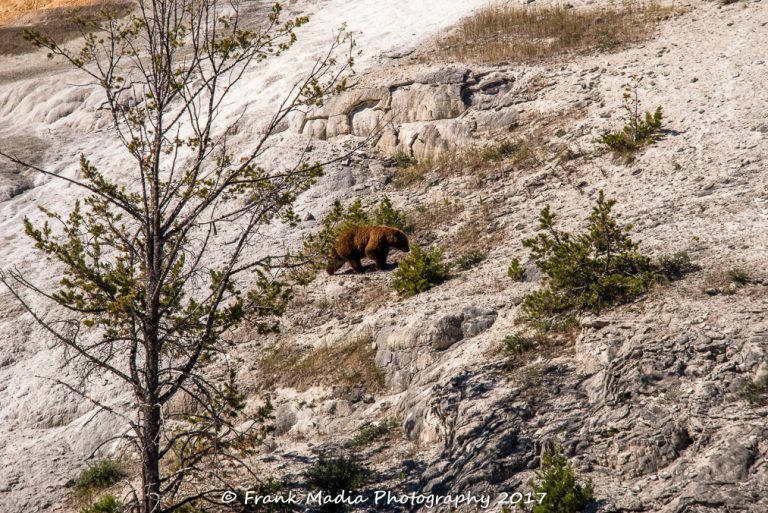 On this day, as we were entering Mammoth we saw not one but two black bears making their entrance to the Mammoth area at the same time. 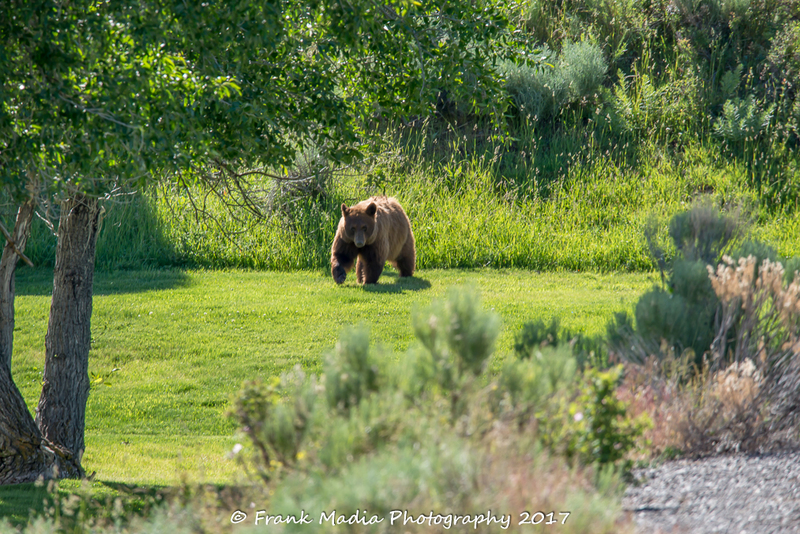 The bears were coming over the hill to the south of the onsite home of the general manager for the hotels and restaurants. We stopped in a nearly empty parking lot to get better looks and maybe some photographs. 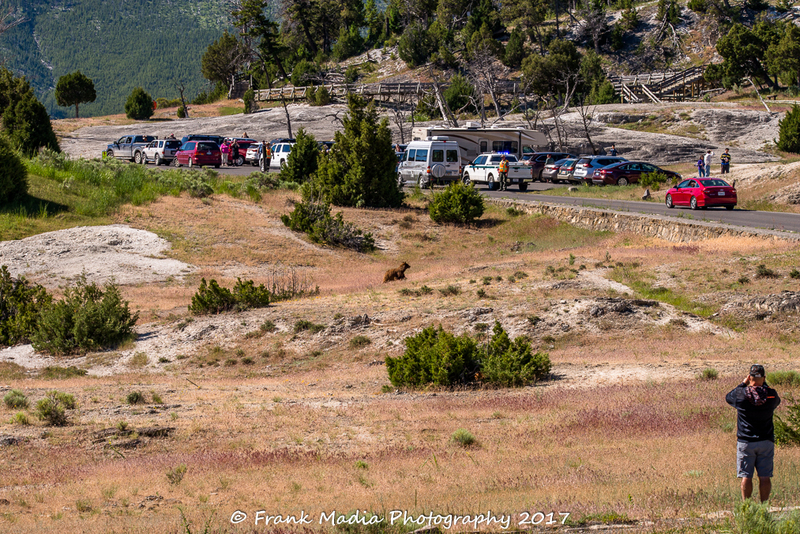 It wasn’t long before the parking lot was full, the roads were impassable due to the stopped vehicles and we found ourselves working the traffic and crowds to keep everyone, including the bears, safe and the traffic on the road moving. I had recently purchased a new lens and was itching to try it out in the field. I was not prepared for the arrival of these bears and therefore was not able to get any quality images of these two before I had to abandon my camera for my traffic control vest. We always carry a park radio, traffic control vests, and a National Park Service ballcap with us when we travel in the park. That way, if there is some sort of event going on without park service supervision we can help keep things under control until uniformed help arrives and relieves us. On this day we were assisted by a maintenance worker who had been trying to get to his assigned duties when he came onto the scene. It took several minutes before any law enforcement could arrive due to the traffic situation. Complicating the whole mess were the facts that one of the bears had made its way to a location where it was in view from about 270° and was trying to cross the road that very quickly was completely clogged with traffic. 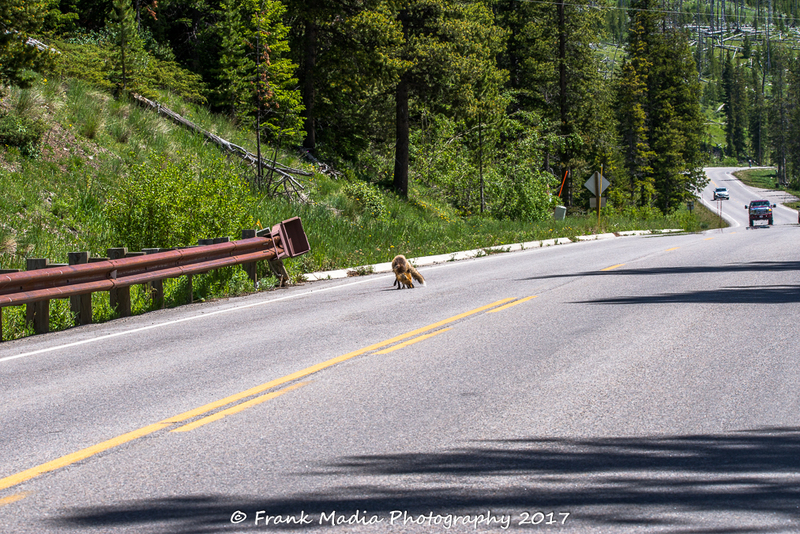 With only three of us trying to control things, we were stretched thin as the bear kept going back and forth looking for a place to get across the road. There were people out of vehicles all over the area and as the bear changed its direction people found themselves well within the 100-yard range the park service has determined to be the safe distance. So, we had to help make folks understand they needed to back away while at the same time try to open a lane for the bear to cross the road. It was a challenge for sure. Finally, our supervisor, Ranger Allan Bush, was able to make his way to our location. He helped move the people who were out of vehicles back to safety via his loudspeaker. As more law enforcement personnel arrived, traffic was finally moved clearing a path for the bear to get across the road and get on with its day’s business of looking for food. I said there were two bears when we first sighted them. One of them had made an abrupt right turn as it descended the hill and we lost it in the sage. We never saw that animal again that day. I had concerns that it would reemerge somewhere along the way where people were watching the other bear. An approach from the rear could have caused big problems. Fortunately, that did not happen. When all was said and done, we lost about 45 minutes of our day, but boy did we have some fun. I need to also point out that even though this scene seemed a little chaotic, the cooperation of the many visitors was exceptional. Bear sightings at the close distance these two came to the developed area of Mammoth are not that routine. People go to Yellowstone to see bears. Therefore, when they see one up close they naturally want to make the most of the sighting. Our goal is to recognize that desire on the part of the visitors, but also to enforce the safety guidelines the park service has put out so no one including the bears gets hurt. I was delighted that on this day the visitors involved were so willing to give the bear space thereby keeping everyone safe. Before all was said and done we found ourselves working the crowd to keep people and bear separated. I did get some photos made before I had to shift into work mode. 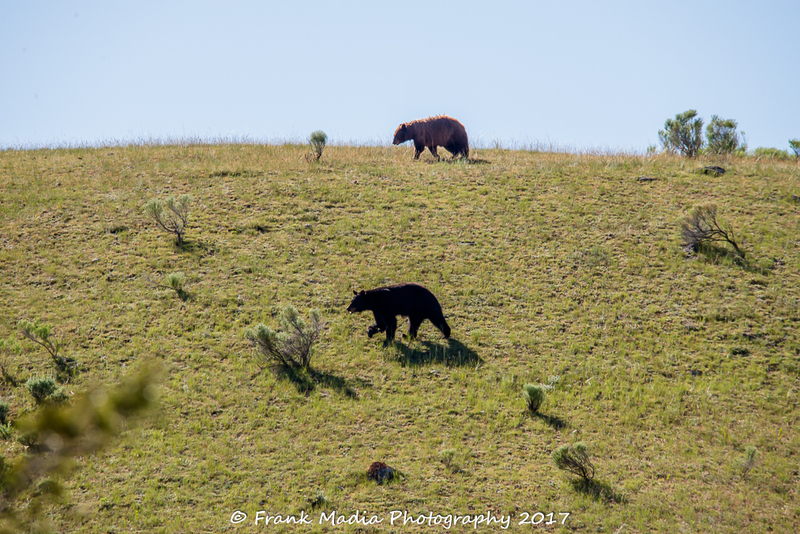 At the beginning of a day trip that would take us over the Beartooth Pass and into Red Lodge, MT for lunch, we spotted two black bears on the hill south of Mammoth. The bears were walking along the ridge, so we stopped to take a look and get some photos. This rather large cinnamon colored bear made its way across the lawn of the hotel general manager’s residence and into an area protected on three sides by the road. Law enforcement rangers were eventually able to clear a portion of the road so the bear had a path to cross. And cross it did. The bear calmly walked along the edge of the hot springs giving folks on the boardwalk a bit of a thrill, I am sure. It eventually moved out of sight and into the forest for a day’s work of eating. After such an adrenaline fed start to our adventure, we figured the rest of the day would be sort of boring. We were wrong. Just outside the Northeast Entrance as we were leaving Silvergate, I spotted a fox in the middle of the road. I stopped the car and eventually got out to get some photos. I was once again practicing with my new lens. Later, after reviewing the images I had wished I had used a more tried and tested lens. In other words, the resulting images were not my best work. I did a have a few that are worth sharing though. 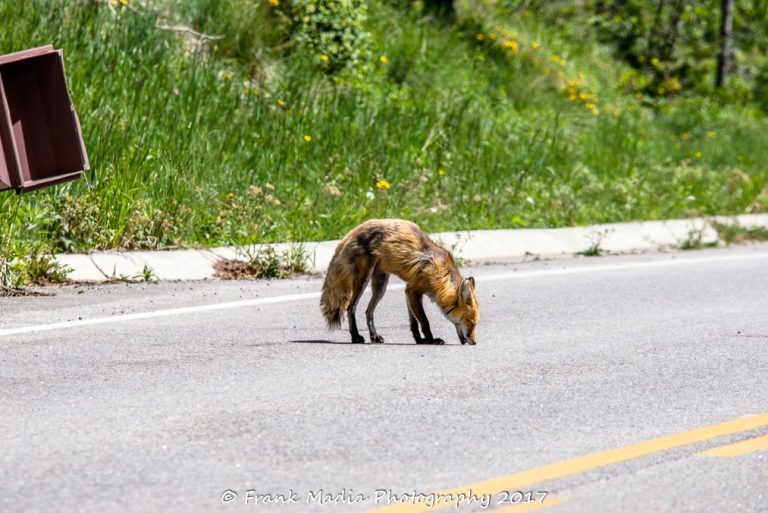 Just after passing through Silvergate, MT on our way to Beartooth Pass and Red Lodge, MT, we saw a fox on the road cleaning up a road kill. We stopped and I was able to make a few images. Once again, I grabbed my camera with the long lens and tried to capture some shareable images. The fox stopped long enough to drink water from the ditch. 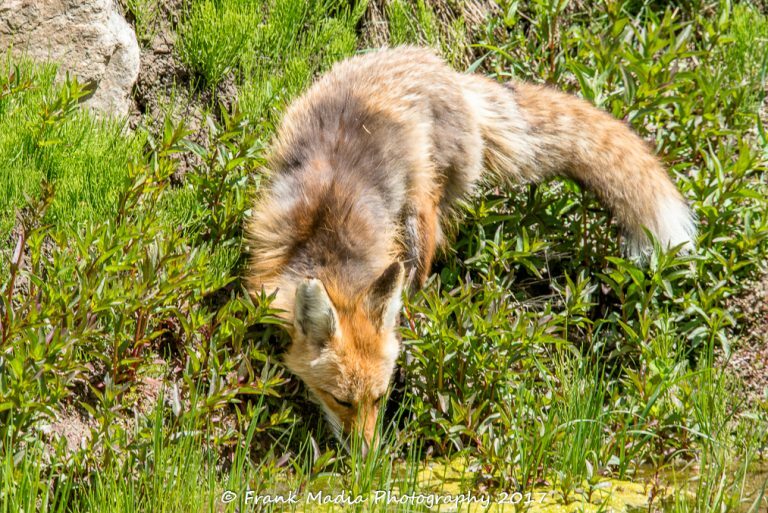 I saved this image more for the blue bug hovering near the fox’s flank than for the fox. Something must have tasted good, as it licked its chops. By now, we were all really charged up. What else would we see? 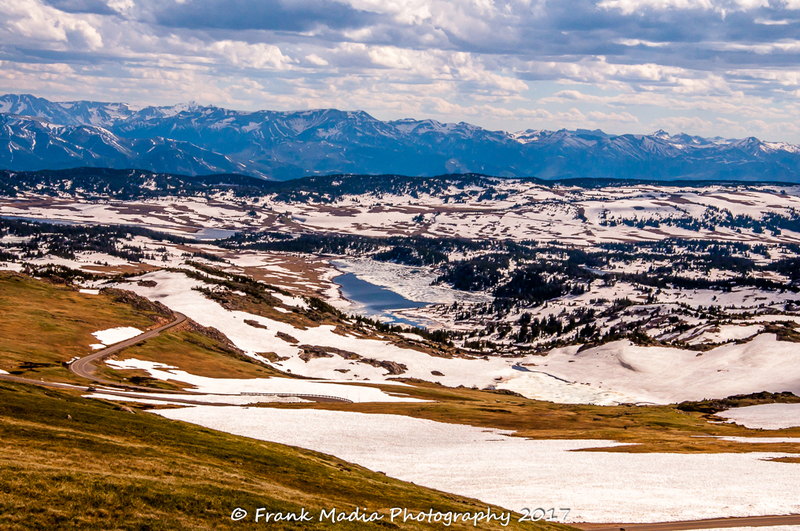 The drive across Beartooth Pass was one of the more interesting drives of that stretch of highway I have had. There was a lot of green, a good bit of snow remaining and ice on nearly every standing body of water. The only downside was the fact that the sky was overcast for most of the drive thereby muting the colors some. Here are a few images I made along the way. 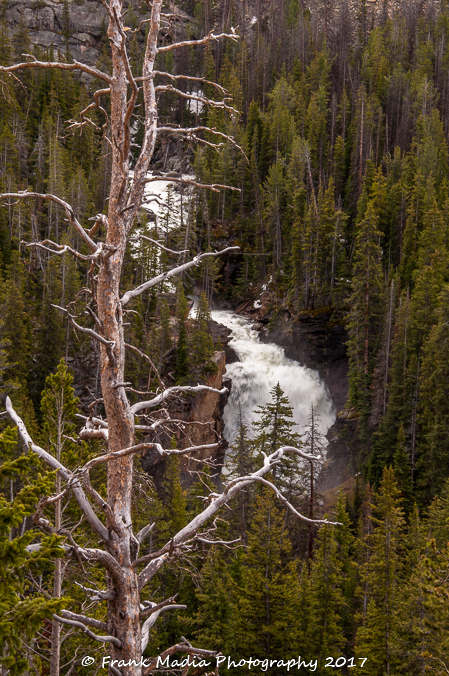 As we started up Beartooth Pass, I noticed the swollen river and rushing water. The views from near the top of the pass remind me of the tundra. The broken clouds made for interesting shadowing. The incoming gray clouds seemed a bit foreboding, but we continued on. One last view across the great expanse. The small lakes visible here were still mostly frozen over. I always put my cameras away when we get to Red Lodge. Not because I don’t like Red Lodge, but because as you may have noticed, I rarely make photographs that include people. Summer in Red Lodge is like high season in any tourist location worldwide. There are people everywhere. I would have to have a binder full of model release forms were I to try to capture images of this small town. So, instead, I just enjoy the moment camera free. Besides, the camera gets in the way of eating. We had a wonderful lunch at a historic restaurant/bar. Well, the building was historic anyway. I am not so sure about the business. None-the-less, lunch was great and the experience even greater. On the way back, we stopped at Rocky Creek Overlook. This is the only place on the Beartooth Highway where there are restrooms. It is always a good idea when you have a carload of senior citizens to stop where you can if you know what I mean. While at the overlook I spotted a Clark’s Nutcracker on a snag a long way off. I could not get closer due to the rock wall with a near vertical drop on the back side. So, another opportunity to test my new lens. I guess this is as good a time as any to introduce this lens. It is a Sigma, 150 – 600 mm telephoto f 5 to 6.3. It is the longest, fastest lens I can afford. This day was the first time I would use this lens other than a few practice shots around the campsite to make sure I understood the controls. My attempt at making photos of the bears in Mammoth was not very good. I was fighting the lighting and exposure as well as wielding a pretty heavy lens to save time getting a tripod setup while the bears were moving through the area at a good clip. My second attempt with the fox was also compromised primarily for the same reasons. I had trouble controlling the weight of the lens while tracking the fox along a ditch. 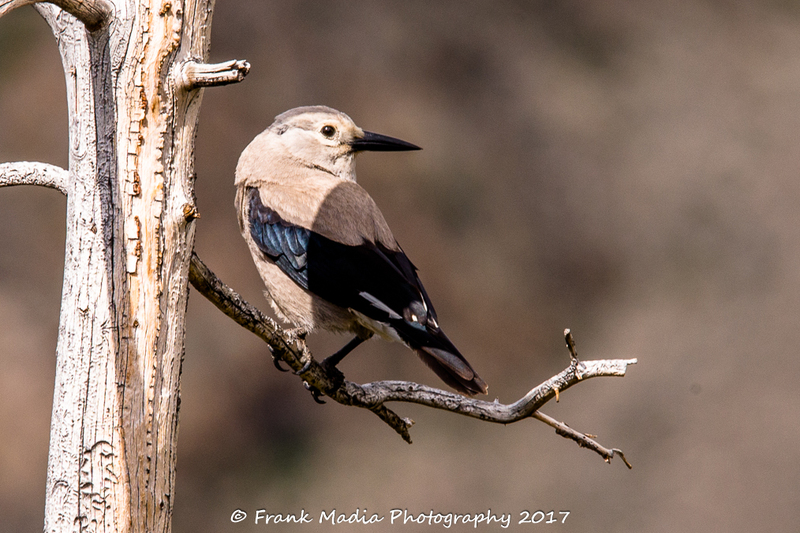 My first few shots of the Clark’s Nutcracker were an absolute joke, as I was literally focusing on a spot that was the same size as the focus indicator. At 600 mm that focus spot moves around a lot. After a few shots, I got out the tripod and made some good images given the distance between camera and bird. Clark’s Nutcracker from nearly a hundred yards away. It was a struggle keeping the focal point centered on the bird. The use of a tripod was a must. A crop of the previous image to isolate the bird. On our way back across Beartooth Pass, we stopped to watch a small family group of Mountain Goats as they meandered along a game trail. At first, it looked as though the goats would get well within photo range as they were heading straight towards us. However, there was a ravine between them and us that ended our viewing before they were close enough to photograph. All in all, it was a great day of sightseeing and spending time with our partners in crime. The day ended as most do with a few beers over dinner in Gardiner. Our second personal visitors of the season were Marty and Pat Riordan from New Hampshire. For those of you who have followed this blog over the years will remember, Pat and I worked together during my final tour of duty in the Navy. She and Marty have remained close friends with Connie and me ever since. Over the years we have managed to get together occasionally. This was their second visit to Yellowstone and we were delighted to visit with them albeit for a very short time. Like me, Marty is in love with the Grand Tetons. So, when they made the decision to visit Yellowstone a second time, the Tetons would play a major role in the planning process. That said, their time close to us would essentially be cut in half. A fact that, while understandable, is frustrating because we all enjoy one another’s company so much. Having dedicated their first visit to the area to sightseeing in the park, we decided that with the limited time we would have together we would spend fewer hours sightseeing and more time just catching up. It was a wonderful visit and dare I say a nice relief for us. What is this Fluff Ball That Fell from the Tree? Early in July, a camper stopped me as I was going through the campground pulling campsite occupied tags from sites no longer occupied. My routine tours of the campground are frequently punctuated with stops to visit with campers to learn how their experience is going or to point out a deficiency. This would be different. This couple had witnessed a ball of feathers falling from a tree. The ball was later identified as a baby Long-eared Owl. They thought I should know what had happened. They got my attention for sure. And sure enough, there was this owlet on the ground and moving around some. Up above were an adult and another owlet both looking down to see what we were up to. Now, I have a reasonable knowledge of birds, but I was not prepared from a knowledge point of view for what I was seeing. I radioed Connie and she advised I should leave the young one alone for now and ask the campers to leave it alone and give the adult space to deal with the situation. The campers were more than happy to oblige. They had plans for the day and would be gone until dinner time. Connie and I had a further discussion as to what to do. We decided I should try to put the owlet back into the tree. There was no way I could reach all the way to where the nest, such as it was, was located. We thought that if I were to get it into the tree maybe with some encouragement from the adult it would make its way back to the nest. Let’s just say I was not able to get the little creature to hold on to a branch. It did a good job of holding on to my gloved finger, but no way would it perch on a branch. I returned it to the ground. By the way, the entire time I was handling this owlet the adult was watching me with penetrating yellow eyes that absolutely creeped me out. For the rest of the day, I kept an eye out for the owlet as I passed the campsite. When the couple camping there returned I stopped to talk to them only to learn that the second owlet was now on the ground as well. The adults were in different trees and when anyone approached either chick there was a good bit of beak clicking that went on from the adult owls. I also noted that the adults would rise and spread their wings in an intimidating fashion that further creeped me out. During our next day off we were able to contact an owl expert who just happens to have been an employee of the park who had retired a few years ago. She and Connie had met at a hawk watch the second season we worked there. She told us that Long-eared Owls fledge differently than most owls and that what we had witnessed was normal behavior. 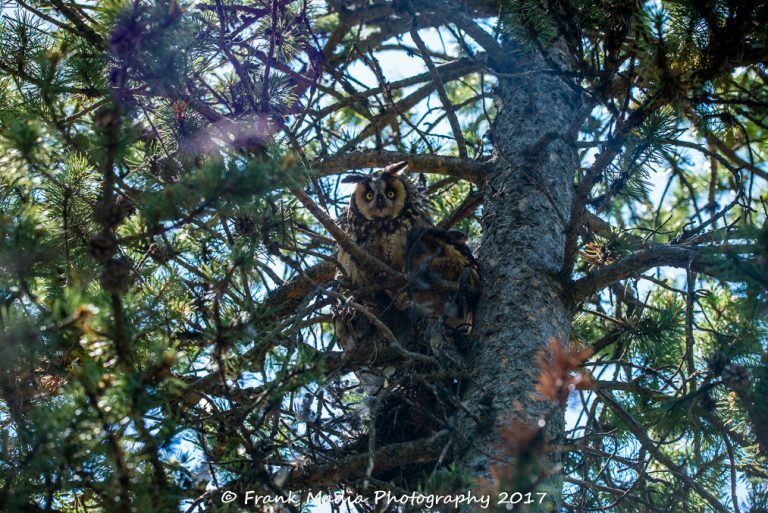 She and a photographer eventually came out and I was able to show them the nest and the location the owlets had been hidden in the few days after leaving the tree. They were eventually able to locate one of the owlets a few hundred yards from the nest tree. And while never seeing an adult, they were warned off by the beak clicking I had witnessed. Connie and I were relieved to learn that the process was normal and that at least one of the little birds had survived to that point. We will never know the outcome, but we can hope. 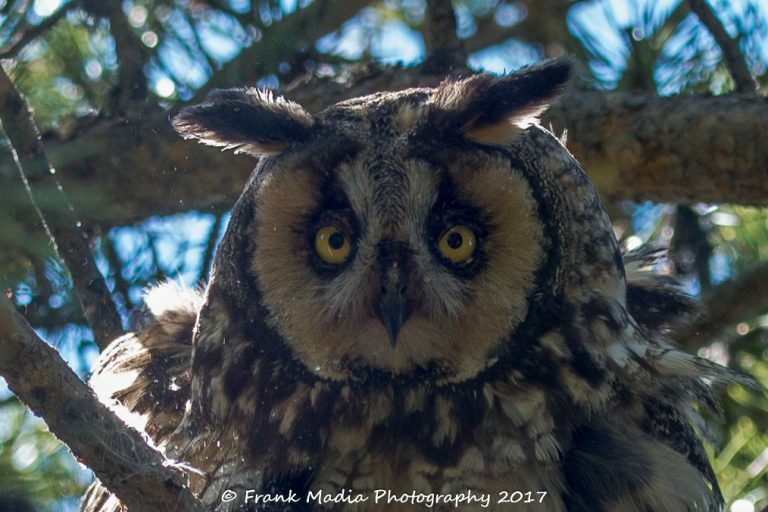 Of course, Connie and I did additional research into the behavior of Long-eared Owls and learned among other things that they do not build their own nests but utilize abandoned nests. The nest this couple had chosen appeared to have been a squirrel nest. We also learned that the adults share the feeding and nurturing of the young. Therefore, it would be incorrect to assume that the adult I first encountered was the mother. That bit of knowledge fixed my choice of terms for this piece. While the young owlets are not capable of finding food for themselves in those early days on the ground, they are provided the opportunity to move around in their environment while the adults take care of the feeding and providing a relatively safe environment. That certainly explains why I was frequently greeted by the harsh clicking of beaks from high above while I was looking all around the ground for the babies. I knew when I was getting close and also that it was time to move away. While nothing would have made me happier than to have made stunning photographs of this family of owls, as a photographer I faced an ethical challenge. 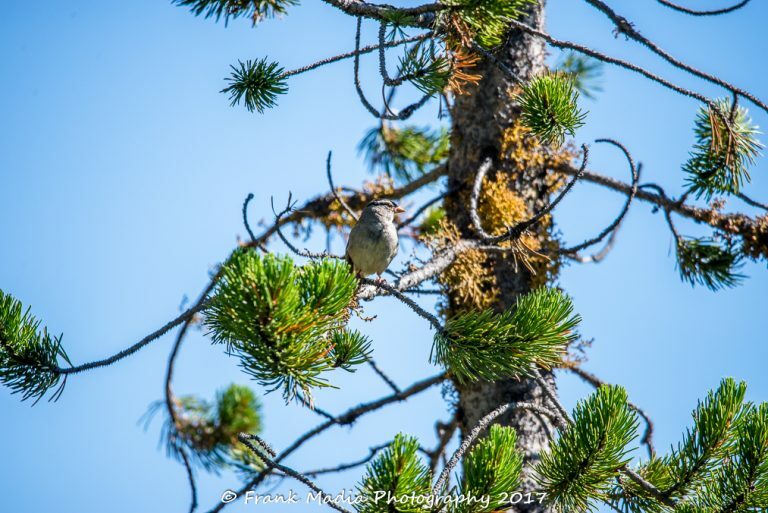 Once we closed the campsites, I felt comfortable making daily tours of the area to keep an eye on the birds, but I could not in good conscience take my camera into the area where I would likely be seen by campers who were already curious about the closure that we had simply called a wildlife concern. That said, I was able to get a few pictures made that first day while the campground was essentially empty. 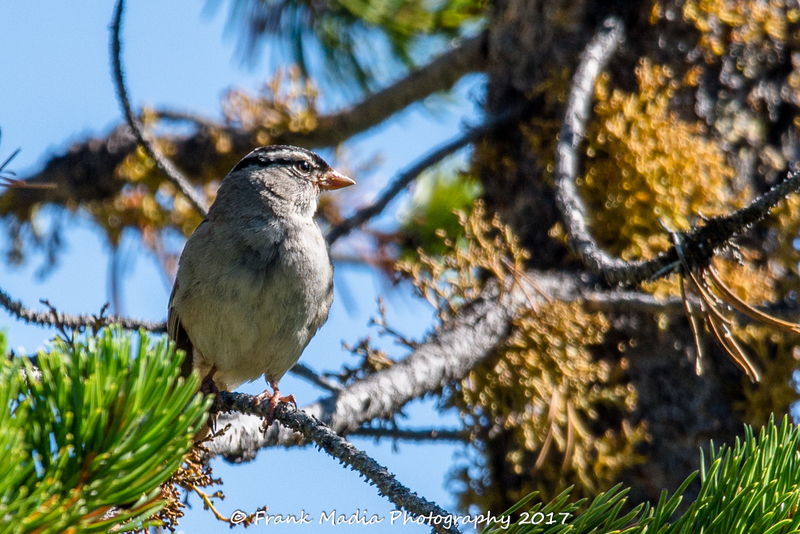 My desire to get quality images was dampened by my respect for the birds and not wanting to add to what I assumed was already a high-stress situation. So, while I was trying to get into a good position to get clear images of the adult and remaining owlet in the tree, I was aware of the stress I was causing and backed away far enough to allow the adult to calm down. Therefore, the images that I share below are not wonderful. That said, I feel comfortable in saying they are reasonable given the circumstances. I hope to someday be able to get a better look and therefore better photos of this wonderful bird. Long-eared Owl with one owlet alongside. 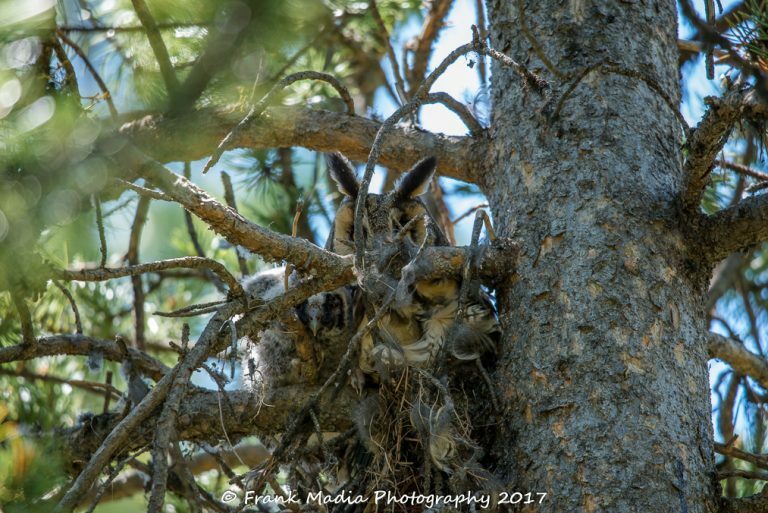 It is very difficult to see and identify the owlet, but it is perched to the right of the adult (left as you look at the photo). The owlet is that little bit of white just above the horizontal branch. It is easy to see how difficult it was to get a clear shot of either bird. That mess in front of the adult is the remains of what had been the nest. As mentioned above we think it was a squirrel nest. Those yellow penetrating eyes will get your attention even if you miss the clicking of the beak. This is a crop of the best image I was able to make of the adult. I leave you here with a few random images I made while practicing with that new lens in the much more controlled environment of the motorhome patio. My final post of the summer of 2017 will include a visit to Sheridan to see my brother and his family and day trips in the Big Horn Mountains, our solar eclipse experience, a long weekend trip to western Idaho and much more. So, stay tuned as they say. A chipmunk joined us for breakfast on the patio. 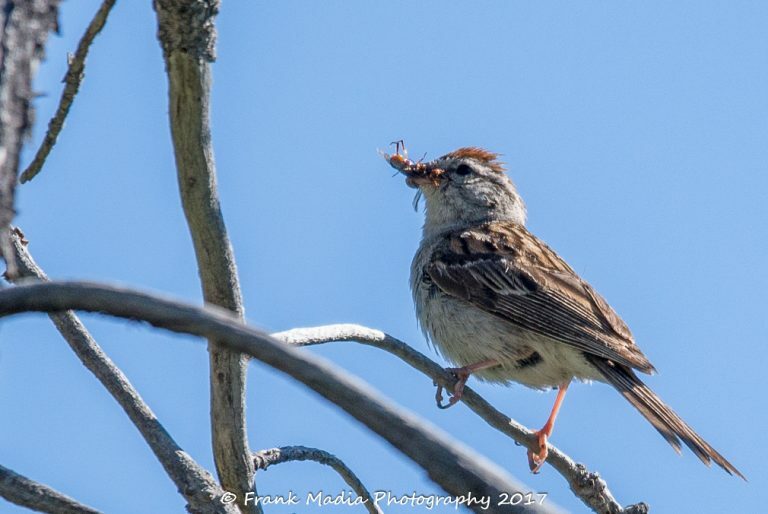 This is a crop of either Chipping Sparrow or an immature White-crowned Sparrow with a rather large bug in its beak. 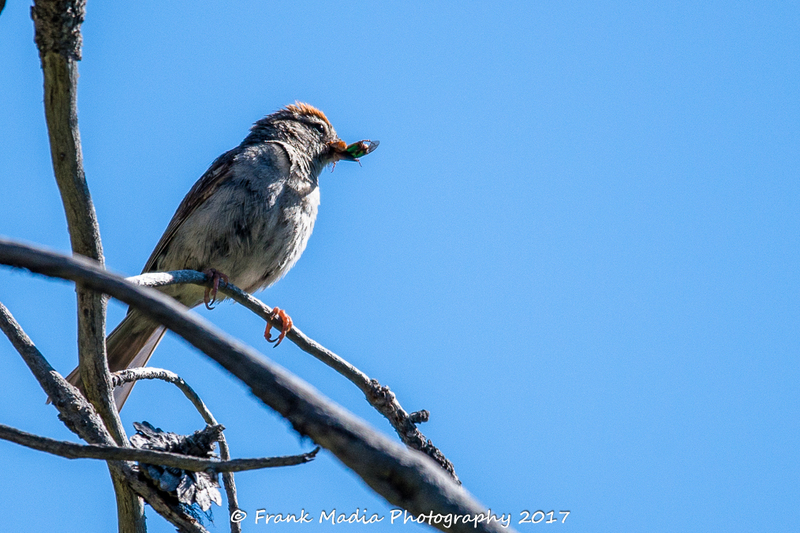 I violated most of the rules of bird photography with this image, especially the rule regarding getting the shine in the eye. The little creatures just don’t always know where and how to stand. I was not able to get a clear enough look at the bird to make a positive identification. However, subsequent to publishing this chapter, I have received feedback bringing my initial identification into question. With that feedback, I took a much more critical look at all the images I made and still being unsure, I consulted an expert birder who I was having an unrelated conversation with. She voted BVD – Better View Desired. Therefore, in my desire to be accurate, I have relabeled this bird as an either or. Once in awhile, I get lucky and the same bird turns around for a better shot. 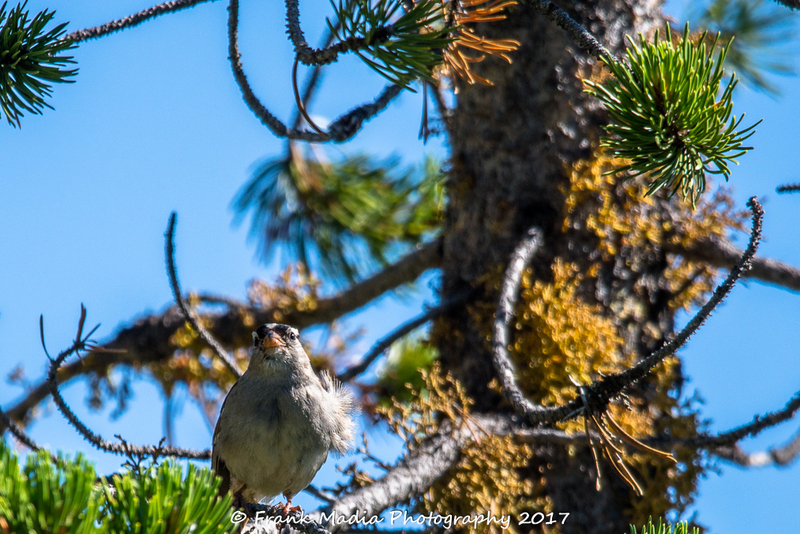 This male White-crowned Sparrow was having a bad hair day due to the breeze. This too is a crop. This is what I could see through the view-finder. This is the same picture cropped to again isolate the bird while still capturing some of the environment. Fascinating and most interesting blog! 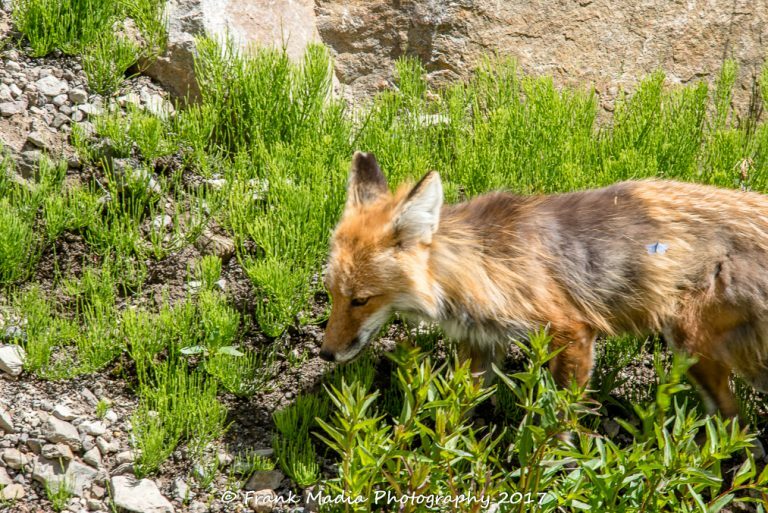 Bears, foxes, owls…..what could be better? i really enjoyed all the photographs. I know you and Connie are extremely valuable to the park. Glad you had your cap and vest handy to help with the tourist traffic jam. 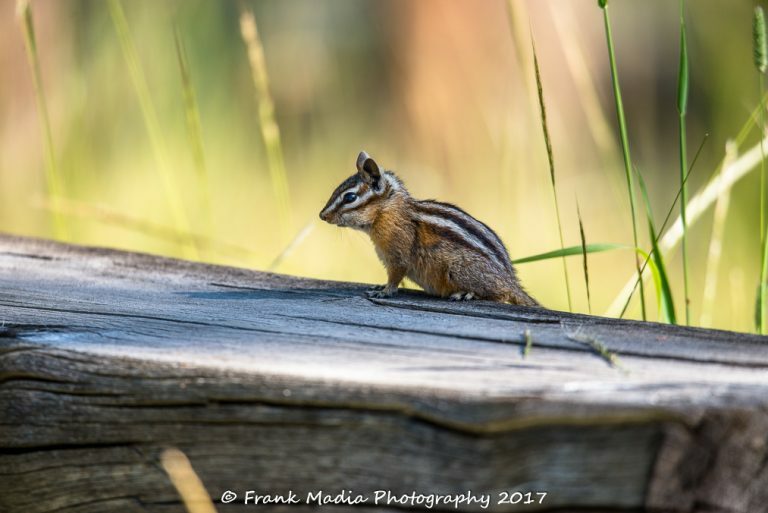 As usual, Frank, your blog is captivating. What fun you and Connie have in Yellowstone. Interesting information about the owls. I know that some young owls branch out but I didn’t know it was typical for Long-eared Owls to go to the ground. Your new lens seems to produce good photos. Though I’m sure the photographer has something to do with that. 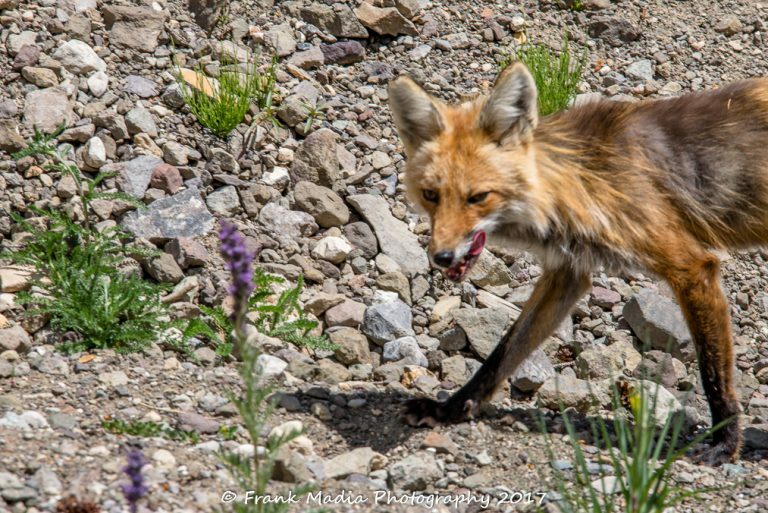 Another great blog, Frank, and Marty and I are honored to be mentioned in it! We always enjoy our visits with you and Connie. We will work to ensure there are more of those!! Love all the photos, too! Hugs to both, from both! This was, by far, my favorite blog! Reading about your exciting adventures made me wish for pictures-and there they were! Not snapshots, but professional photographs. The bears, the fox, the owls. I enjoyed the camping and wildlife information you provided, too. Enjoyed your blog and pictures, as always. Love to you both. Love your blog as usual. Mama Bwana would suggest that you relabel your Gray Jay pictures. Try Clark’s Nutcracker. 😉 Love to you and Connie. Doris, You are absolutely correct and to imagine that Connie is my editor. I will fix it immediately. Thanks.